Vikings wide receivers coach Darrell Hazell is from Cinnaminson. EDEN PRARIE, Minn. – Darrell Hazell would not call it the low point of his coaching career, but it had to be in the running. He was just a few months removed from being fired as the head coach at Purdue in the middle of his fourth season, and now he was making a long drive from his home in West Lafayette, Ind., to Las Vegas for a little getaway vacation with a college friend. "When you're in this profession, you know what can happen," Hazell said. "It certainly makes you think about a lot of things when those things happen. It makes you think about people. It makes you think about situations. It makes you think about whether you should have done something differently or how you could have done things differently." All those things were racing through Hazell's mind when his phone rang as he was passing through Kansas City on that day last February. Minnesota general manager Rick Spielman was on the other end. Vikings receivers coach George Stewart had recently left to take the special teams coordinator job in San Diego, and Spielman asked Hazell if he wanted to interview for the job. "I took a right turn and headed north," Hazell said. Even though he never got to Vegas, Hazell still hit the jackpot. 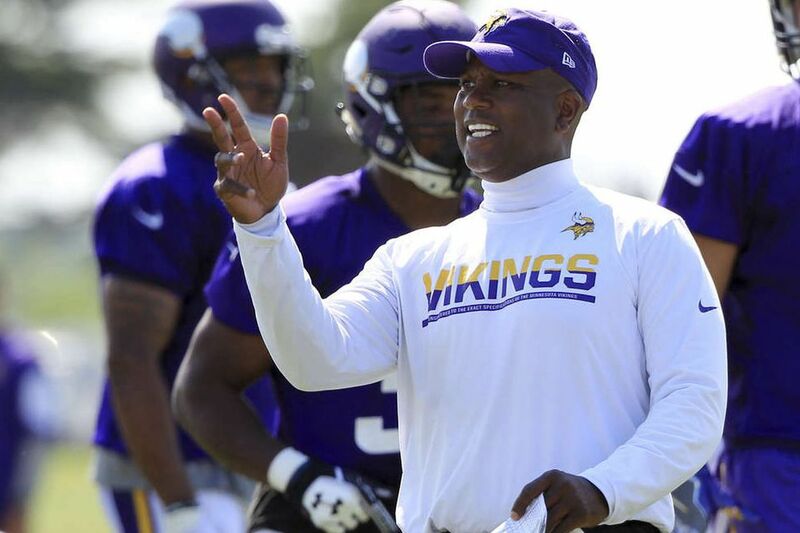 The Vikings gave Hazell, 53, his first chance to coach in the NFL after 31 years as a college coach. He has been part of a mystical ride that had this season's most magical moment Sunday night when Stefon Diggs caught a pass from Case Keenum and turned it into a 61-yard, season-saving touchdown as time expired in Minnesota's surreal win over New Orleans. "That goes in the category of the Immaculate Reception and The Catch," Hazell said. "You could see [Diggs] coming open and then he catches it and I think you had 70,000 people screaming, 'Get out of bounds,' because we were going to be in field-goal range with something like five seconds left. But he just took off and you're in disbelief as the place erupted. That was probably the best moment I've ever had in this game." Even better ones potentially lie ahead, starting with Sunday's NFC championship game against the Eagles at Lincoln Financial Field, just 15 miles from Hazell's boyhood home of Cinnaminson. "Lots of family still there," Hazell said. "My mom is going to come over for dinner. She's 87 now, so I don't know if she'll be able to sit out in the cold. But my brothers and sisters and lots of family will be there." "They better not be that day," Hazell said. Was he an Eagles fan? "I'm not going to comment on that," he said. Hazell, a 1982 Cinnaminson High School graduate, played football and ran track before playing college football at Muskingum in Ohio. His coaching career started immediately after his playing career ended, and it took him to 10 different schools over 31 years, including Penn, Rutgers and Ohio State. He was also the head coach at Kent State before moving to Purdue. Now, for the first time in his life, he is an NFL coach and in his first season, he is on the verge of winning a Super Bowl. "It's a little bit unbelievable that I'm in this position right now if you just wind the clock back to 11 months ago," Hazell said. "You're just kind of hanging out and doing whatever and now here we are a couple weeks away from a potential Super Bowl." Wow, was that some right turn.